The Ziegfeld Follies were a series of elaborate theatrical productions on Broadway in New York City from 1907 through 1931, with renewals in 1934 and 1936. 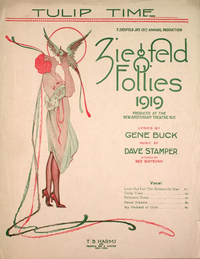 The Ziegfeld Follies were inspired by the Folies Bergère of Paris. They were conceived and mounted by Florenz Ziegfeld. The show producers were Klaw & Erlanger, the top turn-of-the-twentieth-century showmen. The Follies were lavish variety shows, something like music hall or high class Vaudeville. Many of the top entertainers of the era appeared in the shows. The list includes W. C. Fields, Eddie Cantor, Josephine Baker, Fanny Brice, Ann Pennington, Bert Williams, Eva Tanguay, Bob Hope, Will Rogers, Ruth Etting, Ray Bolger, Helen Morgan, Louise Brooks, Marilyn Miller, Ed Wynn, Gilda Gray, Nora Bayes, Sophie Tucker. The Ziegfeld Follies also were famous for many, beautiful chorus girls commonly known as Ziegfeld girls, usually wearing elaborate costumes by designers such as Erté, Lady Duff Gordon or Ben Ali Haggin. 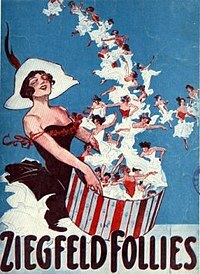 The first Follies was produced in 1907 at the roof theatre Jardin de Paris. The Ziegfeld girls "paraded up and down flights of stairs as anything from birds to battleships." The "Tableau vivants" were designed by Ben Ali Haggin from 1917 to 1925. Joseph Urban was the scenic designer for the Follies shows starting in 1915. After Ziegfeld's death, his widow Billie Burke, authorized use of his name for Ziegfeld Follies in 1934 and 1936 to Jake Shubert, who then produced the Follies. When later it toured, the 1934 edition was recorded in its entirety, from the Overture to Play-out music. First issued as a series of 78 rpm discs, the recording was later released as a compact disc (1997).